Everyone they meet, everything they see and everywhere they go will be a brand new experience for your puppy. And it’s your job to make it all as enjoyable as possible so that they learn to be relaxed, confident and friendly. You won’t be able to take your puppy for walks until they’ve had all their jabs, but you can introduce them to the car, traffic, your neighbours, your friends, the postman – and even buses and trains, if you can carry them easily. Inside the house, get the puppy used to loud noises like the washing machine, the phone and the vacuum cleaner. In all these situations, you need to act confidently and cheerfully. Don’t force anything if the puppy gets stressed, but give them lots of praise and a little treat each time they respond well. Tip: ask people to offer their hands with palms up – or your puppy could interpret friendliness for aggression. If your puppy hasn’t met any children yet, they could be quite a shock. If you can, start by introducing an older child and ask them not to squeal or make sudden movements. Let the child give the puppy a treat and stroke them, but don’t let him or her pick up your puppy unless they’re sitting down – just in case the puppy wriggles out of their grasp. They’ll soon learn to love children, but an adult should always supervise their play. Once your pup’s vaccinated, take them for a walk to meet other dogs. This can be daunting for both of you. Don’t worry too much -- adult dogs won’t usually snap at puppies. 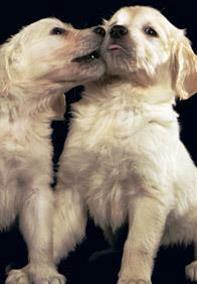 Check with the owner of the other dog, but it’s usually best to leave your dogs to introduce themselves to each other. After a few seconds’ sniffing, they usually play together happily. Again, lots of praise and tactical treats will reinforce your puppy’s confidence. However, a large, bouncing puppy will totally overwhelm a smaller one so it’s usually best to keep them apart until they’re better socialised.